Livorno, Italy, one of the primary port cities of Tuscany. We caught a train at the Zurich airport and did a three hour train ride through spectacular lake and alpine scenery to the southern Swiss city of Lugano. It was there that Leonardo and Ercilia met us and we headed south to Italy. We first met Ercilia nearly twenty years ago, when she was studying English in San Francisco. A close friendship developed, and about ten years ago we stayed with her at the family restaurant and vineyard sited about 1500 feet above the valley floor of Bellinzona, Switzerland. We came to know Leonardo a few years later when they visited San Francisco. Last year we introduced them to the San Juan Islands of the Pacific Northwest and hooked into a few salmon. They insisted that we come stay with them in Tuscany, and so we finally made it happen. We whisked past Lake Lugano, a large lake squeezed between tall alpine mountains, and we were soon waiting in line to cross the border into Italy. The line moved quickly, and after a cursory glance, the guard waved us through. Before long, we were skirting the west side of Milano (Milan, Italy). This flat plain is the Chicago and Detroit of Italy, the home to Ferrari, Fiat and many other big industries. On both sides of the Autobahn were factories and warehouses. An hour later, in receding light, we saw the silhouette of the Apennine, the Italian Alps. We climbed and descended through the foothills of these mountains and soon passed into the Regioni (region) of Tuscany. There are twenty Regioni in Italy, equivalent to our states. 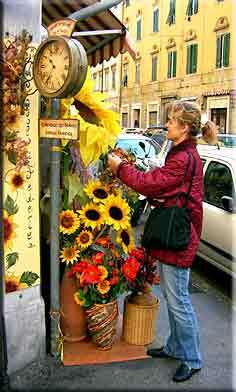 If Italy is shaped like a boot, then Tuscany is the knee, a large region running from the Mediterranean Sea eastward into the rugged Apennine. The coastal part of Tuscany is mostly flat, so much so that the Romans dug a canal from Livorno to join the Arno River, permitting small ships to run all the way to Firenze (Florence), about 60 miles inland. Our destination was Livorno, but it was time for dinner, and our hosts knew of a very good, very discrete restaurant forty five minutes short of Livorno. We came to Lucca, a walled city, the walls about forty feet thick and completely intact from the Roman Empire. 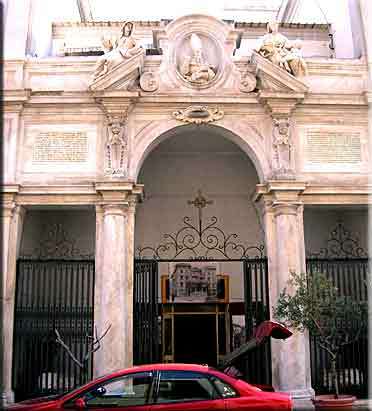 We drove through the wall and parked on the edge of the city, the passageways between the buildings too narrow for cars. As we walked the cobbled passages I asked Leonardo if these buildings predated World War II. He chuckled and said that most of these buildings were built in the 12th century or thereafter, when for 500 years Lucca was one of the first republics. Indeed, Lucca looks very much like it did centuries ago and a population of 30,000 still lives within its walls. We walked across a plaza, then one more alley-way, and ended at a small restaurant, Buca L. Antonio. The proprietor rushed to greet Leonardo and Ercilia and we were soon seated in an alcove, absorbing the antique coziness of the restaurant. An antipasto arrived immediately, with thinly sliced, smoked prosciutto ham, various olives, anchovies, sharp pecorino cheese and other delights. Most Italians don't even argue about the claim that Lucca has the best olive oil in the world, and a bottle was set for us to pour on the crusty, rich bread, a tradition followed throughout Tuscany. A sommelier arrived in formal robe, to pour a merlot. This dark wine had a tremendous body and smoke flavor from the oak barrel; it was absolutely the best merlot I have ever had, and of course it was from the hills of Lucca. For my entre, I selected a pasta with rabbit sauce. The pasta was rolled out minutes later, cut into one inch wide strips, torn into 2 inch lengths and dropped into steaming water for a quick al dente boil. The pasta was turned in the pan of rabbit sauce, covering it completely, but not drowning it. The flavors were subtle, with no one spice shouting supremacy. Although the waiter offered to grind fresh parmesan over our entrees, Ercilia explained that locals usually decline, preferring to savor the flavors created by the chef. The same philosophy holds in Japan, where the locals never drown their sushi in soy sauce and wasabi. As we finished our meal, I asked the proprietor how old the restaurant was. "It has been in continuous service since 1782," was his reply. "It was one of the favorite restaurants of Puccini, the famous opera singer," and to prove his point, he gave Pat a copy of his book on the life of Puccini, which included an appendix of thirty pages of Puccini's favorite recipes. 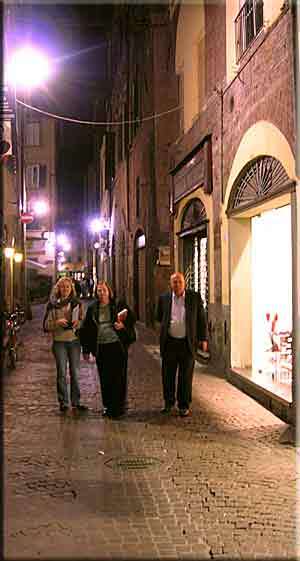 Walking to dinner in Lucca. Our staging point was Leonardo and Ercilia's beautiful flat in Livorno. From the outside, it looked to be just another five story row house with a door opening onto the street. The first floor housed shops with glass windows facing the street, and behind them a law office. Each of the upper floors has two flats. Behind their door, Leonardo and Ercilia's flat was spacious with a four meter ceiling. The bedrooms opened off a central hall, with a comfortable study at one end and a living room at the other. Leonardo is a gourmet cook, and so it was natural that the kitchen was the center of activity, with a table placed so that conversation was easy while work in the kitchen went on. The Etruscans, Romans, Charlemagne, and Napoleon all held the region of Tuscany at various times, so it is no surprise that Livorno became a fortified port, although it does not appear to have been particularly effective at holding invaders at bay. In the 17th century, Livorno experienced a renaissance, and the city was laid out is a way which exists today. Canals were dug to allow boats access to the city. This old part of Livorno, near the harbor and fortress, is called the Venice part of Livorno. Many of the 170,000 residents live in flats, giving Livorno a high population density. Rush hour consists mostly of scooters and electric bicycles as distances to work tend to be small. Traffic in the streets is relatively light, until evening, and then the residents come out to socialize. The streets become animated with groups of friends, dog walkers, young people and couples. It struck me that this city uses energy sparingly, and yet its residents seem to enjoy a vibrant life style. 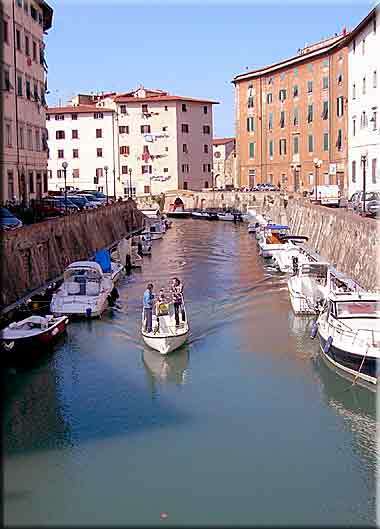 A canal in the "Venice" section of Livorno. The waiting list for this boat parking is long. 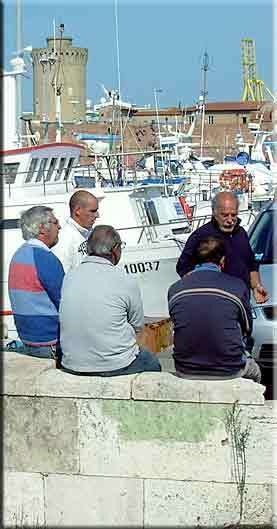 Fishermen, solving the world's problems. 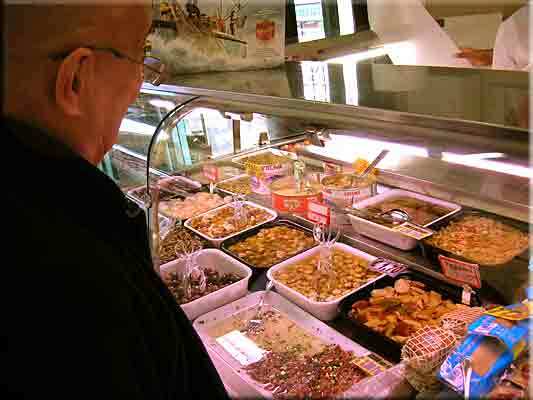 The morning market is an essential part of Leonardo's routine. 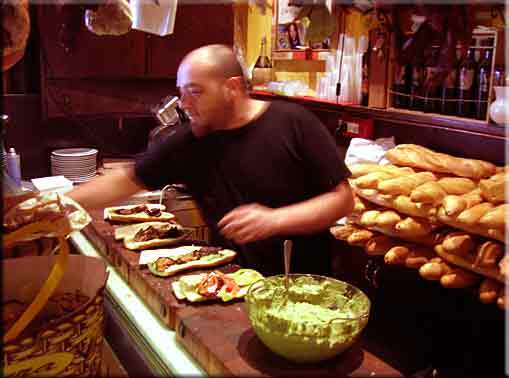 Panini for lunch, the original subway sandwich. Olives, anchovies, garlic and other essential accessories. 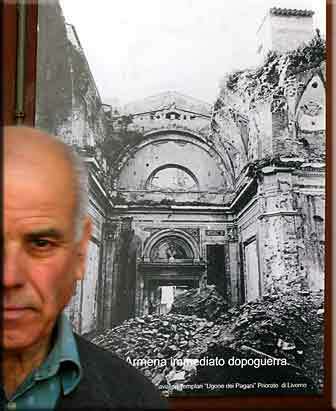 Picture of a WWII damaged cathedral in Livorno.